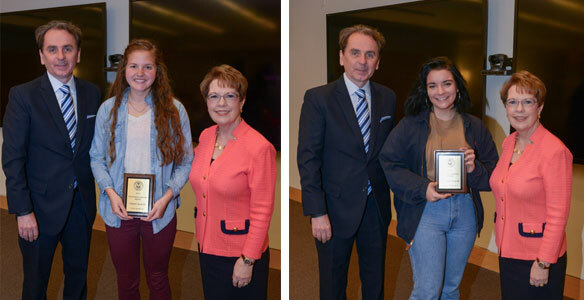 Provost Julian Schuster and President Beth Stroble congratulate Freshman Writing Award first-place winner Anna Grobelny and second-place winner Mariah Pugliese. The Webster University 2015-16 Freshman Writing Award ceremony was held April 8. Anna Grobelny won first prize for her essay entitled “How the Outside World Shapes Our Own,” written for Julie Setele’s sociology class. Grobelny’s essay addresses her experiences growing up as the daughter of a St. Louis County Police officer. Mariah Pugliese won second prize for her essay, “Parsifal and Adolf Hitler,” written for Joshua Burel’s First Year Seminar course. Pugliese’s essay is an examination of the relationship between the work of composer Richard Wagner and Nazi leader Adolf Hitler. Both students received an award plaque from President Elizabeth J. (Beth) Stroble and Provost Julian Schuster.